We here at ProfessionalRakeback.com have just received word that the Winning Poker Network's fast-fold poker product is in final testing and will go live within the next few weeks (ETA February 2019). 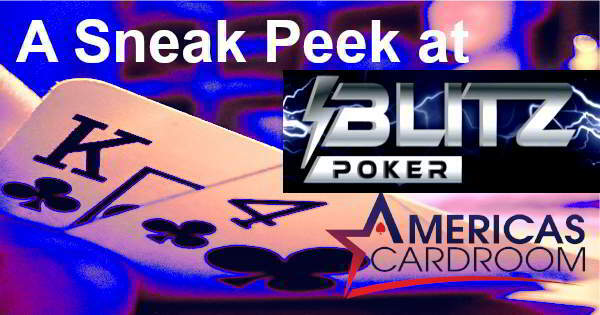 Called Blitz Poker, it will first be offered solely through the Americas Cardroom mobile poker client. The expected timeframe for launch is just a few weeks from now, our source within the network confirmed. The plan is to then add Blitz functionality to the normal desktop client in early summer, perhaps as soon as April or May. Just as with similar products by competitors, in Blitz you won't sit continuously in the same seat at the same table throughout your poker session. Rather, you'll be brought to a new table whenever a hand ends or whenever you fold. This eliminates much of the downtime traditionally associated with poker, and it means that you may be able to see up to 500 hands per hour in Blitz. There will be a “Fold and Stay” button that will let you muck your hand but still remain at the table to observe the hand in progress. We're not 100% certain on how this feature will work exactly because Blitz is still in development, but we expect that you'll be able to end your spectating of the current hand at any time and jump right to a new hand. You won't be able to identify precisely who's playing in any Blitz pool before joining. However, it will be possible to view the number of users already active in a pool. Initially, Blitz Poker will be confined to No Limit Texas Hold'em at stakes up to around $200NL. There will be only six-player tables to start with. All play in Blitz will count toward The Beast leaderboard. Blitz will debut first on the mobile client, which lacks regular cash games. However, by logging into the mobile software and the desktop application at the same time on different machines, you will be able to play Blitz and standard ring games simultaneously. Presumably, if the format proves a success, the range of blind levels, table sizes, and poker variants spread for Blitz will expand. We may even be able to play Blitz tournaments at some point down the road. All of this, of course, is dependent on a smooth and error-free Blitz rollout: never a given when dealing with a new product that's still being tested even as we write this. The Winning Poker Network is already, in our estimation, the #1 U.S.A. site for tournament poker as evidenced by the fact that its Sunday Special $215 event is the largest Sunday Major open to Americans with $150,000 guaranteed each week. Now that it's adding fast-fold poker to its lineup, it stands a good chance of becoming the favored destination for cash game players too. Currently, the only competitor in this space with an active fast-fold poker ecosystem is the PaiWangLuo Network and its U.S.-facing skins Ignition and Bovada. Incidentally, it's also the American-friendly room with the most ring game traffic. With Blitz Poker, the WPN stands a realistic shot of dethroning PWL in terms of cash game liquidity. The only other U.S.A. offshore poker site with anything similar is the Chico Poker Network (Sportsbetting.ag/BetOnline). However, its Boost Poker struggled to get any action above microstakes, and it is now only listed at $0.05/$0.10 and $0.10/$0.25, attracting few participants. Intertops, on the Horizon Poker Network, also unveiled its own attempt, called simply “Fast Fold,” in November 2013. However, the Fast Fold lobby was virtually deserted, and the entire game was eventually scrapped. It's worth noting, though, that the Winning Poker Network is much larger than both the Chico and Horizon networks. It should therefore not have as much trouble keeping games going even during non-peak hours. 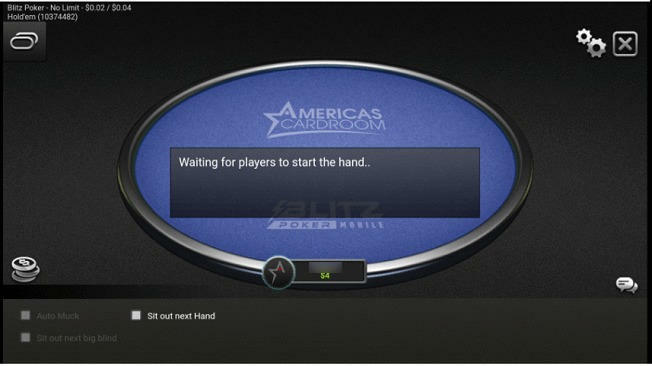 If you wish to be able to sample Blitz Poker when it becomes available, then we advise you to create your new Americas Cardroom account today if you currently lack one. With your first deposit, you'll get a 100% up to $1,000 bonus (worth 20% rakeback) as well as a complimentary $50 credit added to your account. If you want to check out the games first without depositing, then enter in our exclusive PRB10FREE Americas Cardroom bonus code for a $10 no deposit bonus free bankroll offer. Read our comprehensive Americas Cardroom review for all the details. We always make extensive efforts to bring you the latest news and exclusive scoops about offshore poker sites that you won't find anywhere else except ProfessionalRakeback.com! Remember, we told you first about the Winning Poker Network's leaving the Australian market in August 2018 and its plans to add dozens of crypto coins to its cashier in September 2017.